Please check to see that your passport is up-to-date AND that there are sufficient blank pages to accommodate entry and exit stamps for the entire trip. If there is not enough space for stamps, you will be denied entry into South Africa. To all travellers departing for home back to the United States, we recommend that all electronic devices are charged up the night prior to your flight home. This includes cell phones, iPad/tablets, iPods, travelling dvd players, laptops, and any other electronic device taken for a carry-on. TSA has implemented enhanced screening measures at certain overseas airports with direct flights to the U.S. During security examination, officers may ask owners to power up some devices, including cell phones. Powerless devices will not be permitted on board the aircraft. The traveller may also undergo additional screening. South Africa is served by more than 70 international airlines and our national carrier, South African Airways, flies to many destinations in Europe, North and South America, Asia, Australia and New Zealand. Cape Town Tourism staff at Cape Town International Airport will help with any queries you have. However, if you require information before arriving, contact Cape Town Tourism on +27 21 487 6800 / +27 86 132 2223 or email info@capetown.travel. From Cape Town International Airport you can either hire a car, take a metered cab, or catch the MyCiti shuttle bus to the city centre, which is approximately 20km away. For a scenic drive to the city centre, take the MyCiti bus. The MyCiti bus is the cheapest option, costing just R53 for adults and R26.50 for children between the ages of four and 11 (children younger than four travel for free). The bus leaves the airport every 20 minutes between 05h10 and 22h00. It stops at the Civic Centre in Hertzog Boulevard, from where you can catch connecting busses and taxis. Read more about the MyCiti bus shuttle service on the City of Cape Town website. Metered cabs will charge between R300 and R400 to take you to the city centre. When arranging a cab from the airport, you may also wish to consider Rikkis and Citi Hopper. Upon arriving at the conference for the first time, please proceed to the registration desk to collect your conference bag with full programme and other materials. The desk will be open from 08:00 each day in the Center for the Book Reception Area. What you bring with you depends on what time of year you are visiting. A warm, waterproof jacket is essential all year round. Pack light, and remember the basic essentials: camera and attachments; a good pair of lightweight binoculars; adaptor plugs; toiletries including insect repellent and sunblock; medications and prescriptions; extra reading glasses; a Swiss army knife or some such (remember to pack it in your main luggage); sunhat; and notebook or journal. If you are going on safari, then it’s wise to pack khaki clothing, especially if you are planning to do any hiking, as this blends into the bush better. Cape Town is never out of season, with a particularly good, long summer from November to March. These are the most popular months for visitors, who come to enjoy the 11 or more hours of sunshine every day. The average summer temperature in Cape Town is 24.3 degrees Centigrade, with January and February temperatures averaging 26 degrees Centigrade. February is the driest month of the year, with 15 mm (0.6 inches) of rain. Spring (September/October) and Autumn (April/May) are smart times to visit Cape Town as they are usually in-between seasons, when nature is at its showiest. 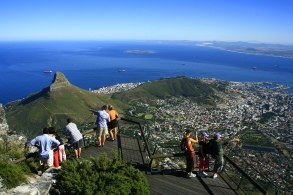 South Africa's currency is the rand, which offers visitors great value for money. The rand comes in a range of coins (R1 = 100 cents) and note denominations of R10, R20, R50, R100 and R200. • The local currency is the South African rand. Foreign exchange facilities are widely available and can be found at the V&A Waterfront, Cape Town International Airport and at bureaux de change in various major shopping centres. • Automated Teller Machines (ATMs) accept most international bank and credit cards. • South Africa has a modern and sophisticated banking and commercial system, and most shops and hotels accept all major credit cards. • VAT: South Africa has a Value Added Tax system of 14% on purchases and services. Foreign visitors can reclaim VAT on collective purchases of more than R250. VAT Refund Offices can be found at: Ground level, International Departures, Cape Town International Airport Tel: + 27 21 934 8675. • Foreign exchange facilities are widely available throughout the country. • A 10% tip is standard in restaurants. Tables of over eight people often have an automatic service charge added to the bill. A tip of R5 to R10 per piece of luggage is acceptable for porters in hotels and at airports. In some shopping areas, uniformed attendants will either take a fee or offer to mind your car for a tip. • It is not obligatory to tip an informal ‘car guard’ for services rendered. If you choose to tip, that is permissible, but informal guards are not allowed to ask for money, either before or after the service is supplied. A tip of R1 to R5 is acceptable. • As a rough guide, give about US$10 (or equivalent) per day to your safari ranger. • Roaming mobile network services are available in South Africa. • If you wish to join a South African mobile network, you can buy or hire a cell phone at the airport or at most of the major shopping centres. • Blue public phones operate on coins (50c, R1 and R5 coins are best), while green public phones operate with local Telkom phone cards, which you can purchase in a variety of shops and post offices. Most public phones advertise the closest sale point. • Local couriers can help you ship your purchases home and deal with formalities. 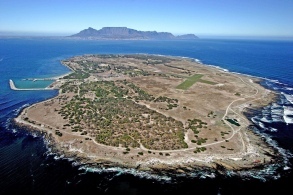 Check with Cape Town Tourism Visitor Information Centres for contacts. • Postage stamps are available at Post Offices, as well as at some Cape Town Tourism Visitor Information Centres. • Internet café charges are reasonable. You will find internet café facilities at some Cape Town Tourism Visitor Information Centres. • Many hotels and accommodation establishments have wireless internet connections. Ask before you book. Capetonians have an amusing array of colloquial terms. Become one of us and throw in some South African slang! Braai What you would know as a barbecue, and probably one of the first things you will be invited to do on arriving in Cape Town. We even celebrate national Braai Day on 24 September every year! Cooldrink or colddrink This is the common term for a soda. Ask for a soda in South Africa and you will receive a club soda. Eish (‘Aysh’) Zulu expression of surprise, bewilderment or shock. Just now If a South African tells you they will do something “just now” they mean they will do it in the near future but not immediately and possibly not ever. Lekker (Pronounced ‘lekk-irr’ with a rolling ‘r’) Afrikaans word meaning nice. Also cool, good, great. Probably the most famous of South African words, so make sure you learn this one. Pavement South Africans walk on pavements and drive cars on the road. The pavement is the sidewalk. Robot South Africans tend to refer to traffic lights as robots. Sci-fi fans are out of luck – R2D2 and C3PO are not hanging about on every street corner. South Africa has been well known for its medical skill since Professor Christiaan Barnard performed the first successful human heart transplant in the country in 1967. There are many world-class private hospitals and medical centres around the country, especially in the urban areas, while many state hospitals also offer excellent care, among them Groote Schuur Hospital in Cape Town. Personal medication: There are pharmacies throughout South Africa, and many everyday medications, such as painkillers, are available over the counter. Some large chain stores, like Clicks, also have in-store pharmacies that offer good value for money. If you have a specific medical condition, it’s wise to carry the relevant doctor’s prescription with you. In the event of you losing your medication, a qualified pharmacist should be able to source a replacement, even if the trade name differs in South Africa. • High-quality tap (faucet) water is available across the city and it is both palatable and safe to drink straight from the tap. • The quality of the food is excellent, and Cape Town has some of the top resaurants in the world. • Medical facilities in Cape Town are world-class. There is an excellent network of both state and private hospitals. • We have a warm sunny climate and you should wear sunscreen and a hat whenever you are out of doors during the day, particularly between 10am and 4pm. • If you're an adult, you won't need any inoculations unless you're travelling from a yellow-fever endemic area (the yellow fever belt of Africa or South America), in which case you will need certification to prove your inoculation status when you arrive in the country. • Hepatitis B inoculations are recommended for children up to the age of 12 who have not completed the series of injections as infants. • Cape Town is not a malaria area. • Most of South Africa is malaria-free, but if you are visiting the Kruger National Park or low-lying parts of northern KwaZulu-Natal, be aware that you are entering malarial areas and should take precautions in the form of prophylactic medication. • There are facilities for disabled people (although fewer than in the United States or many parts of Europe). All major hotels will have facilities for disabled people. When renting a vehicle, discuss special needs and parking dispensations with the car-hire company. • Use common sense and take basic safety precautions. Keep valuables locked away and don’t wear expensive watches or jewellery, flash expensive cameras, or walk in deserted areas. Keep car doors and windows locked at all times. If in doubt, ask a guide or at your accommodation for safety guidelines. • Avoid carrying large sums of cash, carrying cameras or video cameras in plain sight and leaving belongings unattended. • Heed the advice of your hosts, Cape Town Tourism Visitor Centre staff or locals on where to go after dark. Try not to walk alone. • Do not allow strangers to assist you in any way at ATMs. • Street children and beggars may approach you for a handout. Many social workers counsel against giving money to the children as it usually gets handed over to an older person or is used to purchase drugs. • At night, park in a secure, well-lit area. South Africa has an extensive road infrastructure including national highways and secondary roads. Speed limits are set at 120km/h on highways; 100km/h on secondary roads; and 60km/h in urban areas. Most roads are in good condition, but there are a few exceptions. There are rail connections between the main centres, such as Johannesburg and Cape Town. Major malls generally stay open till about 21h00. • Most shops and businesses are open between 09h00 and 17h00 on weekdays and on Saturdays until 13h00. • Major malls tend to stay open later: up to 21h00 during the week, on weekends and on most public holidays. • Government agencies keep to limited weekday only hours, often closing around 15h00. • Most banks close at 15h30 weekdays, but are open on Saturday mornings (from around 09h00 to 11h00). • Muslim-owned businesses close between noon and 13h00 on Fridays. • Most stores, cinemas and restaurants are open on most public holidays. The exceptions are Christmas Day, December 25 and New Year's Day, January 1.